We spend a lot of time explaining why insurance is good for individuals, society and the economy as a whole, but a new report reverses that equation. It focuses on the current and anticipated impact of women on the global insurance market. Conducted by the International Financial Corporation (IFC), AXA and Accenture, the report estimates that women’s individual spending on insurance premiums will grow to between $1.45 trillion and $1.7 trillion by 2030–half of it in just 10 emerging economies. That represents a doubling from the current annual premium value of the women’s global market of $770 billion. The report cites an increased level of education, income, improved socioeconomic status, and a greater need for protection as key reasons that make women a big opportunity for insurers. Furthermore, women entrepreneurs now represent one-third of the world’s business owners, and they need protection for their businesses. Just 31 percent of women entrepreneurs surveyed held protection or savings-oriented life insurance, for example. The report also highlights that women’s attitudes to fraud, claims and loyalty, their roles as a trusted source of recommendations, and their relational rather than transactional approach to networks make them a valuable customer and inexpensive brand ambassador for insurers. Women can act as strong advocates or social marketers for insurers and financial services firms, and are more likely than men to recommend a product or service to their friends and family, the report finds. They are also greatly influenced by the advice of their female peers. Therefore, women can play a key role in explaining and selling insurance products across customer segments, and especially to other women. What women want and need from insurance varies by age, income level and lifecycle events, however. 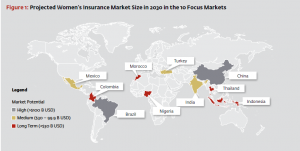 The report urges insurers to abandon the one-size-fits-all approach and instead identify and target segments of women who share common needs and constraints in order to take advantage of this growth opportunity. Check out I.I.I. facts and statistics on careers and employment to discover what percentage of the insurance industry workforce comprises women.